When it comes to understanding the crisis in Venezuela, the new self-proclaimed democratic socialists revert to the old trope of Stalinist era lefties. In the old days of the Cold War, the horror that emerged after the Soviet takeover of Eastern Europe—discussed in great depth in Anne Applebaum's Iron Curtain: The Crushing of Eastern Europe—was "explained" in this manner by the fellow-travelers of the Old Left: The purge trials, arrests of dissidents, their torture and years of imprisonment may have been harsh, but were all necessary to preserve socialism and prevent a "fascist" takeover from occurring. And if people they knew to be innocent were caught up in the net, they told everyone they were guilty because the "people's democracies" only arrested the guilty. In the '60s, the New Left acted in the same way as their descendants, justifying the brutality, the firing squads, and the torture of prisoners engaged in by Fidel Castro's revolution by noting the hostility of the United States to an independent people's revolution against the tyrannical Batista regime. Whatever subsequent infringements on freedom took place, they too were necessary to protect the revolution from CIA attempts to destroy it. Any criticism was unjustified, since it too helped America's imperialist agenda. The old democratic socialists and social-democrats of that era, however, never went along with that warped logic. True to their belief in democracy as the only system of government worth preserving, day in and day out in their small publications, such as Partisan Review and Dissent magazine, they did what they could to bolster the opposition to Communist tyranny and did not let cries that they were helping "McCarthyism" stop them. So, when it came to the Cuban revolution and Castroism, unlike the New Left, they had no illusions about the supposedly wonderful socialist paradise Castro was creating in Cuba. And this brings one to Venezuela today, and the reaction of the new socialists and the left in general. As Noah Rothman points out in Commentary, almost in unison, the response of the democratic socialists—from Bernie Sanders to AOC and Ilan Omar and Rashida Tlaib—has been shameful. Even worse is The Nation magazine, which has always been steadfast in defense of left-wing totalitarian regimes, from the Soviet Union on to today. 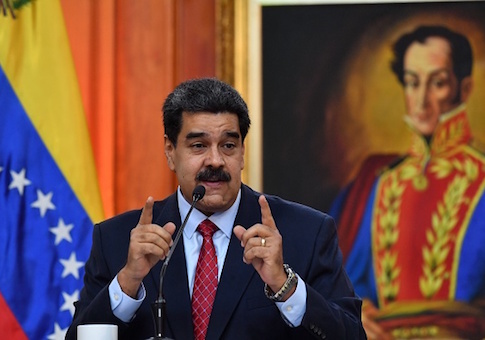 They highlight a column by historian Greg Grandin, who is not the slightest bit satisfied with what he sees as a weak response from the base, and shock that the liberals by and large are with the Trump administration in opposition to Maduro. Bernie Sanders "botched his response," because before opposing U.S. policy, he correctly called Maduro an illegitimate president. The left of the Democratic Party, he proclaims, "needs to sharpen its crisis-response message." Even Grandin, however, gives the cat away when he says the subdued response occurs because "the Maduro government is hard to defend except in the abstract." His Nation colleague George Ciccariello-Maher, a longtime supporter of the Chavista revolution, condemns the United States for its "attempted coup underway in Venezuela." And he refers to Juan Guaido as a "relatively unknown second-string political from the right-wing Popular Will party," which as Venezuelans well know, is a centrist social-democratic party affiliated with The Socialist International. The U.S. has a history of disastrous interventions in Latin America. Glad to have colleagues who are willing to speak up so that history doesn't repeat itself! The link to one of her "colleagues" is to none other than The Nation article by Greg Grandin, a man who, as Bret Stephens informs us, wrote in his Nation obituary for Hugo Chavez, "the biggest problem Venezuela faced during his rule was not that Chavez was authoritarian but that he wasn't authoritarian enough." Democratic Socialists of America (DSA) categorically opposes any and all efforts by the US government to intervene in the domestic politics of Venezuela. The US has a long and bloody track record of actions to overthrow democratically elected governments, stop the spread of socialism, and maintain US imperial dominance in the region. This includes the US government's support of the 2002 Venezuelan coup that led to the temporary ouster of the legitimately-elected president of Venezuela, Hugo Chávez. These imperial interventions must stop immediately; the future of the Venezuelan people, and the broader prosperity of Latin America depend on it. Now that there is a legitimately elected new president, who won the leadership of the National Assembly and is opposing a leader who won a fraudulent election, DSA stands with the oppressor of the people of Venezuela. Like others, DSA repeats the canard that Juan Guaido is part of "the right-wing Voluntad Popular (Popular Will) party," and accuses him of using a "legitimacy crisis" to proclaim himself president. They note "reports of repression on the part of the Venezulean security forces," as if these are false, and without informing its membership that these security forces are led and often manned by Cuban state security agents operating in Venezuela to keep Maduro in power. As for U.S. policy, DSA accuses the administration of "using Venezuela as a boogeyman to show the dangers of socialism than in playing a constructive role in resolving the crisis." They fail as one would expect to outline what they think a "constructive" policy should be. They are opposed to sanctions against Venezuela, to which they assign the blame of Venezuelans not getting food and medicine into the country. Maduro evidently has nothing to do with the shortages and inflation. Ditto for the country's problem with oil. Instead of corrupt cronies of Chavez and then Maduro destroying the industry, the failure to maintain necessary levels of production is explained by U.S. "sanctions against the oil sector." So, the DSA statement concludes, it is the duty of socialists (they leave out the term "democratic" before socialists, implying that those who aren't democratic but are socialists would approve of their position) "to do everything we can to stop US imperialism and make the world safe for democracy and socialism." Their role is to help Venezuela's people "defend the gains made during Hugo Chavez's presidency." They end by calling on the United States "to immediately cease and desist all attempts to intervene in the internal politics of Venezuela." Do those in DSA who wrote this statement not realize that their stance is the same as that used by the apartheid government in South Africa during the '80s, when the left was calling for sanctions against the regime and regime change? When did socialists stop favoring intervention on behalf of human rights? Their ending is the stale old call: "Solidarity with the Bolivarian Revolution." In articles I have written for the Daily Beast, (here and here) I wrote about how DSA's adoption of the BDS campaign against Israel was a vast departure from the strong pro-Israel views of the organization's founders, Michael Harrington and Irving Howe, as well as their overall concept of what kind of socialism they favored. On the question of support to left-wing authoritarian regimes leading to full-scale totalitarianism, as Venezuela is quickly moving, or as Nicaragua developed during the Sandinista revolution in 1979, today's DSA leaders are actually following the path of DSA's founders. The current DSA policy began when both Harrington and Howe moved away from their old anti-communism and opposition to Marxist-Leninist regimes, and proclaimed that the Sandinista Revolution was in effect "something different," as Howe put it to me, or a "new third force" between imperialism and Soviet style communism. During the Vietnam war, Howe and his comrades searched unrelentingly for a "third force"—a social movement that would provide a way to reject both capitalism and communism. He hoped for such a development in Vietnam, only to find it nonexistent or incapable of political success. The effect was to blind his judgment when it came to a new epoch and events in Central America. The man who once endorsed his friend Joseph Buttinger's writings against Communist and French imperialism in Vietnam now was saying, as he said to me, "I have learned there is no third force." The implication for Nicaragua was that there was no choice but to support Daniel Ortega and the comandantes who took over the country in an armed coup. He and Harrington had now endorsed the "wisdom" of the New Left they had earlier rejected. Howe was at odds with his friend, the late Mexican writer and the most esteemed man of letters in Latin America, Octavio Paz. The winner of the Nobel Prize for Literature in 1990, Paz had written many essays on the failure of the Castro Revolution and the growing drift towards totalitarianism in Nicaragua. Howe had always cited Paz as his comrade, as a social-democrat who opposed communism as he did. He completely ignored, however, what Paz was writing about Nicaragua. That allowed Howe to reconcile with those very New Leftists he once had dismissed as extremists and potential competitors for the title of America's Lenin. In an approving article about him in the New Yorker, it explained that once-radical students had supposedly become "a little older and saw the value of a more tolerant, less dogmatic, more democratic approach to the remaking of society." Therefore, Howe was now willing to "welcome his young critics back." As for Michael Harrington, he was completely smitten with the Sandinistas. He became the U.S. representative to the Socialist International's so-called Committee to Defend the Nicaraguan Revolution. Using the metaphor of the Vietnam era "domino theory"—when U.S. officials argued that if Vietnam fell to the Communists, other non-Communist nations would also proceed to fall—Harrington called the Sandinistas "the good domino," and painted the FSLN as a democratic dictatorship that was an alternative to either a right-wing regime or a leftist Stalinist one. It was a model, he argued, for a Central America that could be truly independent and free to determine its own destiny. He led a three-day delegation of DSA members to the country, and after a private meeting with the top comandantes, (the Revolutionary Directorate,) he wrote that he was "deeply moved by the sincerity and passion of those with whom I talked." Not since George Bernard Shaw was impressed in the same way during his two-hour visit with Stalin in the Soviet Union in 1931 has perhaps another Western socialist been so duped about a revolutionary leadership's true intentions. Of course, Harrington acknowledged that the Sandinistas had committed excesses—a euphemism for the drastic repression of their political opponents—but he explained that could be attributed to the policies of the United States, which should have given them aid and political support. The Sandinista revolution, he proclaimed without any real evidence, was "democratic and pluralist" by nature, and if its leaders moved to left-wing extremism, it was the fault of the American response to their taking power. Or, as a comedian once put it, the devil made me do it. Harrington refused to listen to those who sought through careful observation to explain the totalitarian drift taking place in Nicaragua and was anything but the humane democratic radicalism he thought he witnessed. The last straw for me was personal. I had written four reports on Nicaragua from 1983 to 1987 for the New Republic and other papers and reported on how within a few years of my first visit the country had taken a darker turn. After a trip to interview some of the thousands of refugees who had fled the country in Costa Rica and Honduras, I reported on the types of abuses of power taken against those citizens who differed with the revolutionary agenda. Later in 1987, I traveled through Central America, including Nicaragua, with the late New York City mayor Ed Koch , who had put together a small delegation of representative New Yorkers to assess the situation in the different countries. All of this activity made me a target of the democratic socialists. Howe was so upset about my trips and my writing about events in Nicaragua that he convened a small meeting of top editors from Dissent as well as some DSA leaders, who one by one condemned me for what I had written. The educator Deborah Meier was the angriest. "You may be right about what you say about the Sandinistas," she told me, "but while they are under attack by the American empire, we have a responsibility to extend our solidarity to them." The whole meeting appeared to me as a copy of the "criticism and self-criticism" sessions of the Chinese Communists during the Cultural Revolution. As Howe concluded the meeting, he told me, "We have agreed that you cannot write on Nicaragua in the pages of Dissent." My dissent, obviously, was too much for Dissent to bear! I tried to respond by handing Howe a letter written by a Nicaraguan social-democrat and trade-union leader to workers in Nicaragua on May Day, describing how the comandantes had suppressed strikes and forbidden dissent and thrown union leaders who were not going along in jail. It was reproduced in the United States as a pamphlet with the title, "A Message from a Nicaraguan Dissident." Howe and his comrades had often published such messages from Soviet dissidents, at a time when they had no other voice. Howe looked at the letter and noticed that it was being distributed by the AFL-CIO's American Institute for Free Labor Development. The group was devoted to trying to help create democratic trade unions in Third World countries. Howe glanced at it without reading the letter, and said, "This man is probably a CIA agent." America's leading social-democrat intellectual had now adopted the traditional Stalinist response to any descriptions of repression coming from Soviet dissidents. It was the equivalent of Angela Davis refusing to support imprisoned Czech dissidents after the Soviet invasion of their country, and her reply that they were traitors to socialism who deserved imprisonment. So those who correctly disdain the obtuse and wrongheaded view of Venezuela taken by DSA members and others on the left—people who still see Maduro as a genuine leader of a democratic revolution—should realize that today's DSA is only extending the pattern begun by the group's very founders back in the late '70s and throughout the '80s. In this regard, the new New Left of the 21st century only replicates the foolishness of its predecessors. As the refrain of an antiwar song sung by the late Pete Seeger put, "When Will They Ever Learn?" Ronald Radosh is the author of many books, including his memoir, Commies: A Journey Through the Old Left, the New Left and the Leftover Left, Professor Emeritus of History at CUNY, and an opinion columnist for the Daily Beast. This entry was posted in National Security and tagged Ilhan Omar, Venezuela. Bookmark the permalink. Ronald Radosh is an Adjunct Fellow at The Hudson Institute and a columnist for PJ Media.